Once upon a time (circa 1920), a Hollywood Studio artist built a cottage with cozy corners, quirky angles, sway back roof cape, half timbering and rough cast stucco with inlaid stone and cinder blocks. Throughout the US others picked up this theatrical fancy with nursery-rhyme themes. Storybook style is the outgrowth of European period revival styles: Spanish, Colonial, Old English Cotswold Cottage, Rural French and Normal Village. Storybook houses have added elements of exaggeration, humor and pure whimsy. Turn on one of our Storybook Lanterns and imagine skipping along with Hansel & Gretel in a medieval castle. 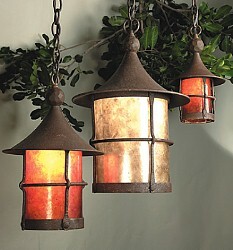 Storybook Lighting by Mica Lamp Company is made of sturdy steel and iron construction and then finished with a druable Storybook Rust baked-on powdercoat to withstand the elments. When ordering, PLEASE SPECIFY (during checkout) your choice of mica color: Orange (the best for ambiance) or Almond (the best to read by). If no choice is specified, we will ship the color that is pictured. For Small and Medium size Lanterns and Pendants, frosted glass lens instead of mica are available and are listed below with the suffix 'G' following the catalog number. Most Mica Lamps are fabricated to order, so PLEASE ALLOW 4-6 WEEKS FOR DELIVERY.